This year being the centennial of the outbreak of World War I (the 'Great War') in 1914, there has been an abundance of articles about it. Not to be outdone, my favourite language magazine The Linguist devotes a section of its current issue to Languages at War. One of the articles is Emerging from the Great War by Sandrijn Van Den Noortgate. As Sandrijn is Belgian, it's natural that some of her article is about Belgians. However, she also produces a surprise: the interpreters of the Chinese Labour Corps. The British army recruited this corps to relieve the workload for the fighting troops on the Western Front, and estimates of its size range from 92,000 to 200,000. Some 40,000 were also recruited by the French. Some were Belgians or had spent time in Belgium. The congregation of the Ursuline Sisters of Tildonk, for example, originated in Belgium, coming to the UK in the 1850s. 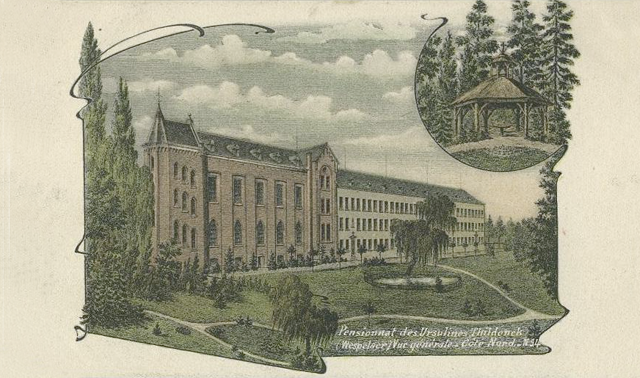 It was a very international community and, from 1895 onwards, all novices spent a year at the convent in Haacht, Belgium [see image]. Many of them therefore knew at least some Flemish. As the Ursulines wished to propagate the Christian faith through community service, it is likely that some of the nuns volunteered as interpreters. Belgian priests were also a good source of interpreting." So here we have an example of a religious order producing Native Interpreters because it was an international organisation – as are, of course, many religious organisations of all faiths. Also of how the contexts in which the organisations work draw them to interpreting. Religion has been a great stimulus for interpreting as it has been for written translation, and it still is. See the numerous mentions of church interpreters on this blog. The very different story of the Chinese Labour Corps takes us to the other side of the globe and of humanity. But there are connections. First the Churches. Many of the labourers were Christians and were recruited by missionaries. And then much of what we know about the labourers' sufferings comes from the diary of Father John Van Welleghen, a Belgian parish priest in Flanders who kept a diary throughout the war. 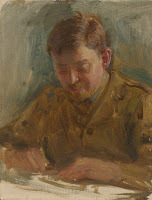 His entries reflect the sympathetic attitude of the local people towards victims of the abysmally racist British Army's harsh methods. Though volunteers, they had signed contracts committing them to three years of military discipline and they were segregated in camps under armed guard. 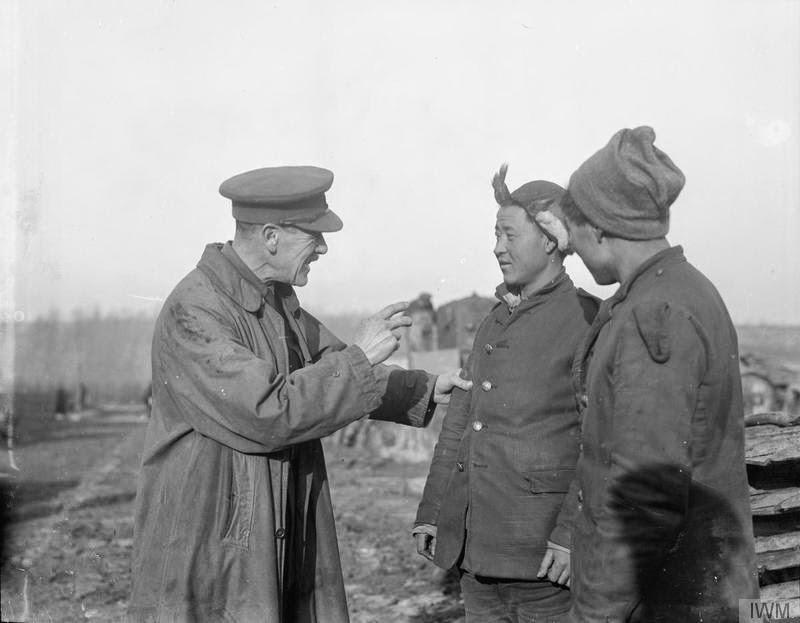 The French behaved slightly better; they at least allowed many Chinese to stay on in France after the armistice. A Chinese phrase book prepared by the British Army is suggestive: Less talk, more work, Why don't you eat this food, This is a bad business. Which brings us to the language problem. Most of the labourers were illiterate peasants. One solution might have been to teach some of them basic English or French, but it would have been slow. Then the recruiters in China hit on an unexpected pool of ready-made Native Translators. English and French were being widely taught in Chinese universities and missionary colleges. "Along with the mainly illiterate peasants came a few hundred ambitious Chinese students to act as interpreters, keen to discover new ideas and European culture. They found themselves interacting with a class of Chinese they had not encountered before. In Chinese society of the time… an educated person would have no contact with the illiterate masses. Yet the war threw them together, and with lasting consequences." Since those consequences were social and political, they are beyond the scope of this blog. However, they constitute an interesting example of the effects of interpreting on the interpreter. One interpreter stands out as a particularly valuable source, because he later published his memoirs. His name was Gu Xingqing. "Gu's book is the only book-length account of the First World War by a Chinese national known to exist… Gu tells the story of his journey from his home village in China to Europe, his work in France and Belgium and his return home. Although published nearly two decades after the events, Gu's account proves to be highly accurate in terms of dates and events. His main source… were the notes he had taken in Europe but which he lost during a Japanese raid… in Shanghai in 1932." Unfortunately it's not available in English. But it stands alongside Mantoux's account of the Paris Peace Conference or the Barón de las Torres' report on the Hitler-Franco meeting at Hendaye as a case where the most reliable source for historians is the notes taken by the interpreters. Sandrijn's article starts off with an important error. Her subtitle reads, "The professionalisation of interpreting began during WW1." The statement only makes any sense if all interpreting is equated with conference interpreting; and we may observe that Sandrijn, according to her profile in the magazine, is herself a conference interpreter. Professional Conference Interpreters tend to be dismissive of other branches of interpreting. The facts are that the French had professionalised trade interpreting in the Levant and in Canada (les Interprètes du Roy) by the 17th century; that their army had a corps of interpreters for its North African campaigns in the 19th century; that the British had professionalised their diplomatic interpreting in the Middle and Far East by the mid-19th century (see my article on Ernest Satow); that Mr Melas in the Sherlock Holmes story The Greek Interpreter was a professional court and tourist-guide interpreter in late Victorian London; and that even Paul Mantoux, the father of modern conference interpreting, was a wartime Professional Military Interpreter before he was assigned to the Paris Peace Conference. There are photos of him in his army uniform. And so on. Sandrijn Van Den Noortgate. Emerging from the Great War. The Linguist, vol. 53, no. 5, pp. 10-11, 2014, The Linguist is published by the Chartered Institute of Linguists (CIoL), London. Go to http://thelinguist.uberflip.com/t/34433 or click here. Helen Fitzwilliam. First World War: China's forgotten foreign legion. The World Today, vol. 70, no. 3, 2014. http://www.chathamhouse.org/publication/first-world-war-china%E2%80%99s-forgotten-foreign-legion or click here. There's a short documentary film attached to the article. Gu Xingqing. Wikipedia, 2014, http://en.wikipedia.org/wiki/Gu_Xingqing or click here. 1. Tildonk Ursuline Convent. Source: Deelnemers, Tildonk. 2. 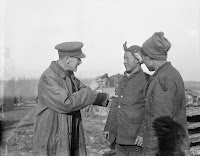 British officer with CLC labourers. Photographer: 2nd Lt. David McLellan. Source: Ministry of Information Official Collection. October 23 marks the anniversary of the famous meeting between Hitler and Franco in the railway station of the strategic French frontier town of Hendaye (Spanish Hendaya) in 1940. Hitler came as conqueror of most of Western Europe and most recently France. Franco was the victor in the Spanish Civil War of 1936-39. Both were members of the alliance of fascist dictators called the Axis. Yet despite their initial cordiality and nine hours of talks, neither of them got what he'd come for. There was a post on this blog about it in 2010. Since neither dictator spoke the other's language, the meeting could not have gone ahead without interpreters. Three interpreters were involved, two German (Gross and Schmidt) and one Spanish (the Barón de la Torres), but only Gross and the Spaniard actually interpreted that day. The single Professional Expert, Schmidt, was sidelined because he didn't work in Spanish, but he was there to supervise and observe. De las Torres was an Advanced Native Translator who had learnt German well as a foreign affairs official. As for Gross, we know about him only that he wasn't an Expert and was not really up to the task. The post was well received; one comment described it as "like looking at a film." But 2010 is already a long time ago. So this year, with some additional information at my disposal, I've retrieved the post from where it's buried in the blog and worked it up into a full article. And for good measure, I've thrown in the post from 2012 about Hitler's subsequent meeting immediately afterwards with France's Pétain, likewise interpreter mediated. So if you're interested in the history of diplomatic interpreting, or in Spain's ambivalent role in World War II, or in spying, get over to my page on academia.edu (https://independent.academia.edu/BHARRIS, or click here) and open or download the article At the Gateway to Spain. Having more or less recovered from the tiredness that beset me after the journey to Ireland and England, I can now foresee regular resumption of this blog no later than October 23. That's the anniversary of the interpreter-mediated meeting between Hitler and Franco in 1940. Meanwhile I'm preparing my survey and taxonomy of interpreting for publication. A Spanish translation was published some 20 years ago, but for some reason the English original has lain gathering dust. Unfortunately part of the file has been corrupted in the meantime and has to be reconstituted. I want to thank all the people who made my Ireland-England trip possible and turned it into a happy memory. The cheerful staff of Dublin City University and the COLING conference, my fellow members of the International Committee on Computational Linguistics (ICCL), my kind English cousins who drove me around and the staff at Bletchley Park. And last but not least the ground staff of Ryanair. Ryanair is a very successful low-cost Irish airline. Not only are their flights dirt cheap if you fly on the right days, but they operate services that nobody else does. Non-stop flights from Valencia to Dublin for example. But they don't have a good reputation for customer service. Well, I too have had a moment of anxiety with them and it's no joke navigating through their online reservation system, But I must say that on this occasion their ground service for passengers with a mobility problem was impeccable at every airport: efficient and friendly. Incidentally, we decided in Dublin that the next COLING will be held in Osaka, Japan, in late 2016. I break silence today because it's another anniversary. 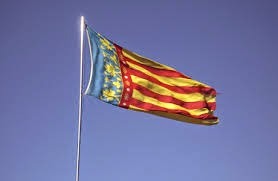 El Nou d'Octubre (Ninth of October), the national day of Valencia. For earlier posts about it, enter octubre in the Search box on the right. It's the day when King James I of Aragon entered the city, making it finally Christian. He'd arrived nearby with his army a little earlier, on September 28, 1238, and he used the intervening days to negotiate, with the aid of Jewish translators, a bloodless rendition by the Moors. Meanwhile he camped his army on the stretch of Mediterranean seashore where I now live and which is today called Pinedo. It's five km south of the city centre. There's a stone cross to mark the site, but it's had to be moved inland because of coast erosion. James wasn't only a formidable warrior, he was also a very able administrator and there are still vestiges of his administration. Hence the Valencian College of Notaries is the oldest professional association of notaries in Spain; their current building is a landmark. Want to celebrate it with me? There's a rousing performance of the Valencian national anthem on YouTube at https://www.youtube.com/watch?v=esDfiT4H_XM or click here. But if you fancy something less political, go to YouTube https://www.youtube.com/watch?v=FXHcc12kWYY or click here.